"When you're in a battle against an enemy so much bigger, so much stronger than you, to find out you had a friend you never knew existed, well, that's the best feeling in the world." 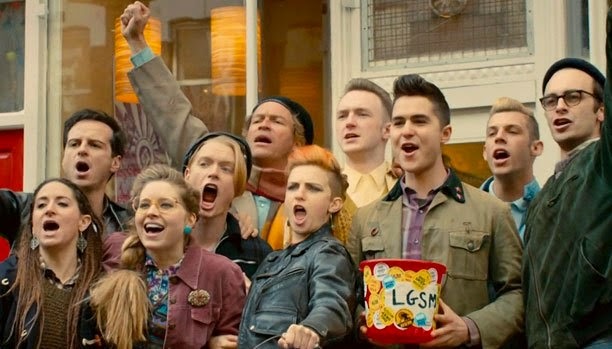 Pride (2014) is an unapologetically cheery and thoroughly heartwarming tale of solidarity in the face of social injustice and alienation. It's a story of dissimilar people coming together to share similar life experiences. As Mark watches a report on television about the miners' strike against Margaret Thatcher's oppressive regulation, he sees something of himself in the miners. Knowing that they couldn't lead more different lives, he decides to support them anyway, and while there's friction at first, eventually the two communities come together to share the burden of living as outsiders. The film tackles the theme of alienation at three levels. There's the large scale conflict with the government and with social stigma; there's the small scale conflict of the gay community with the miners and of Joe with his family; and there's the conflict from within, whether that's strife within the gay community or Joe's internal conflict within himself (beginning with his hesitation to join the movement and ending with his family's pressure to question his "choice"). Pride talks about sexuality together with labor unions (there's a wonderful moment where "every woman is a lesbian at heart" is sung to the tune of Solidarity Forever), and thereby reaches toward a general experience of social exclusion which is relatable whether or not you identify with either group. On a technical level, the biggest standout is the cast. Everyone is just fantastic. The young leads leave a strong impression: Ben Schnetzer is captivating and charismatic as Mark, and George MacKay is touching and relatable as Joe. Paddy Considine is the perfect intermediary between the two initially antagonistic factions. Imelda Staunton is hilarious and Bill Nighy is lovable. The characters are all well written, and by the end of the film you won't want to leave their world. 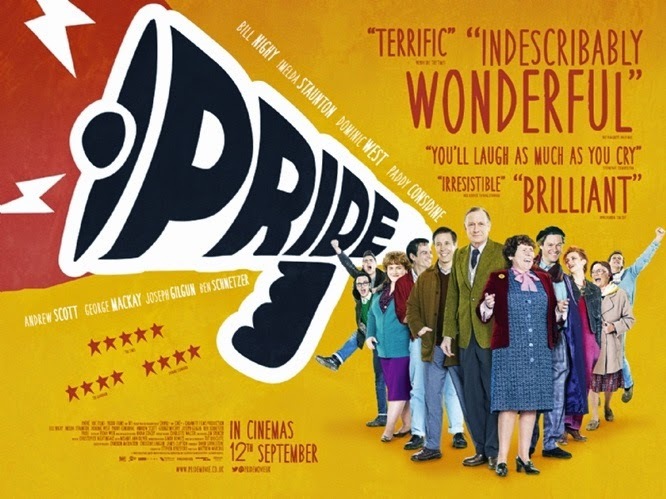 Pride is actually slightly similar to The Imitation Game, not only in the sense that both movies are works of historical fiction which talk about sexuality, but also in that they both have similar weaknesses. Like Imitation, Pride lacks some of the complexity of its real-life counterpart (ignoring the movement's socialist tendencies and only skimming the surface of the issues surrounding HIV/AIDS). The difference with Pride is that it handles the topics it does choose to discuss effectively, and it more than makes up for its shortcomings with the intense joy it captures. Rather than relying on the inherent curiosity of its historical backdrop, it fills its characters with detail enough to survive on its own merits. One of the year's warmest and most delightful comedies.